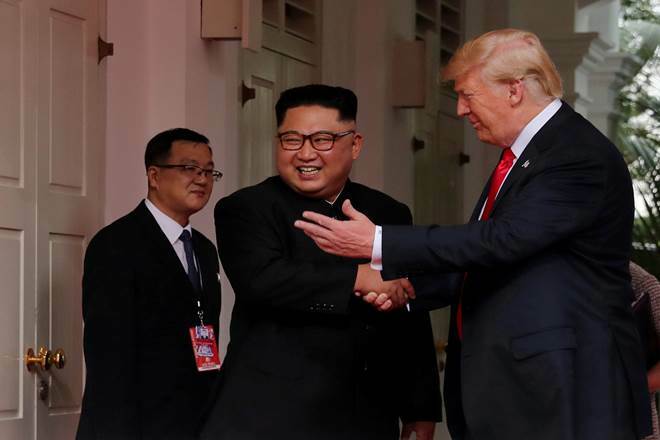 Trump-Kim meeting LIVE updates: US President Donald Trump and North Korean leader Kim Jong-un have created history with an unprecedented summit that saw both of them shaking hands. Trump-Kim meeting LIVE updates: Trump and Kim are now participating in a one-on-one meeting, after initial greeting, and only translators are reportedly present. 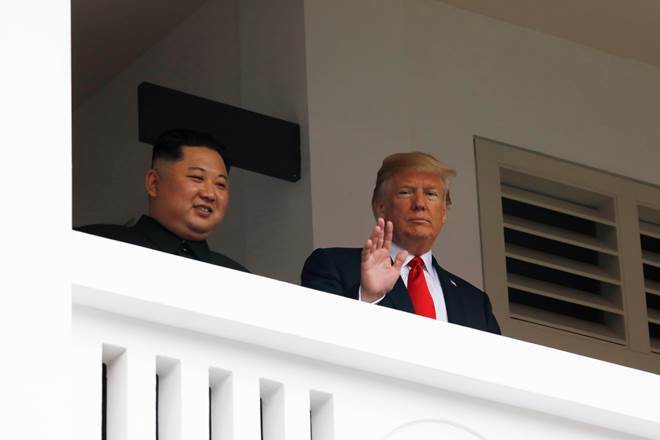 Trump-Kim meeting LIVE updates: US President Donald Trump and North Korean leader Kim Jong-un have created history with an unprecedented summit that saw both of them shaking hands. Trump and Kim are now participating in a one-on-one meeting, after initial greeting, and only translators are reportedly present. Subsequently, there was an expanded bilateral meeting, and a working lunch. Trump is said to leave Singapore at 8.00 pm local time on Tuesday for his country. News agency PTI reported today that two Indian-origin ministers in Singapore – Vivian Balakrishnan and K Shanmugam – have played vital role in facilitating the Trump-Kim meeting. Balakrishnan is Singapore’s Foreign Minister. He had recently visited Washington, Pyongyang and Beijing to ensure a smooth historic meeting hosted by Singapore. Shanmugam is Singapore’s Minister of Law and Home Affairs. His responsibility was to ensure no glitches from the security point of view. Singapore is one of the very few countries of the world having bilateral relationship with both the US and North Korea. Trump says "will solve a big problem, a big dilemma"
In nuclear meeting with Kim Jong Un, Donald Trump said that by "working together, we will get it taken care of". 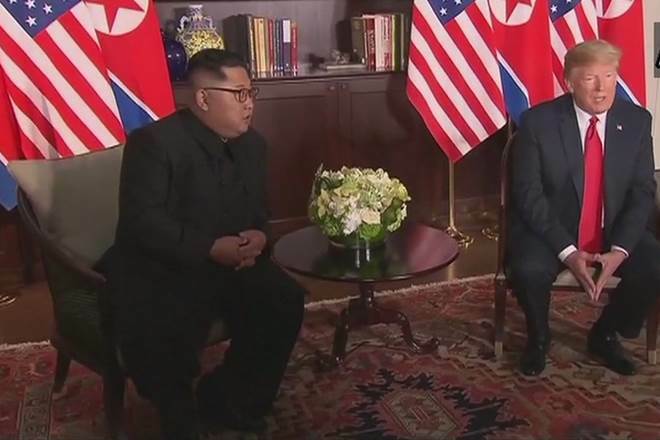 Trump also predicts that he and Kim Jong Un "will solve a big problem, a big dilemma"
US President Donald Trump and North Korea's Kim Jong-Un came out after 41-minute one-on-one meeting. 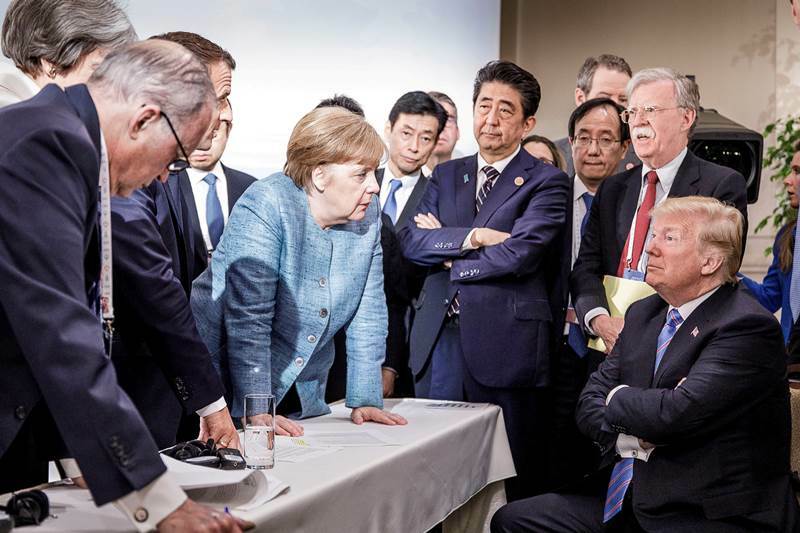 US President Donald Trump said he feels really great, we are gonna have a great discussion and a terrific relationship. North Korean leader Kim Jong-Un said it was not easy to get here, there were obstacles but we overcame them to be here. The 34-year-old North Korean leader also brought a group of trusted lieutenants to Singapore, with at least four high-powered women including his own sister. North Korean leader Kim Jong Un has set a deadline of Tuesday for ending the Singapore summit, prompting President Donald Trump to move up his departure to Tuesday instead of Wednesday as planned, as reported by Bloomberg News on Monday. The report also stated that Trump had been willing to stay longer if negotiations were progressing, but since Kim set definite plans for departure, so did Trump. Donald Trump says Kim is a 'very talented man' and he will 'absolutely' invite the North Korean leader to the White House. Trump says the summit went "better than anybody could have expected. 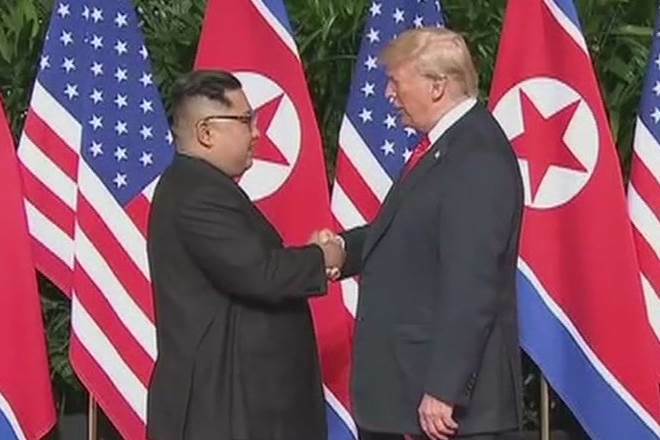 'We'll meet again & we'll met many times', says US President Donald Trump, when asked if he and North Korean leader Kim Jong Un will meet again in the future. 'Absolutely', says US President Donald Trump, when asked if he would invite North Korean leader Kim Jong Un to the White House. 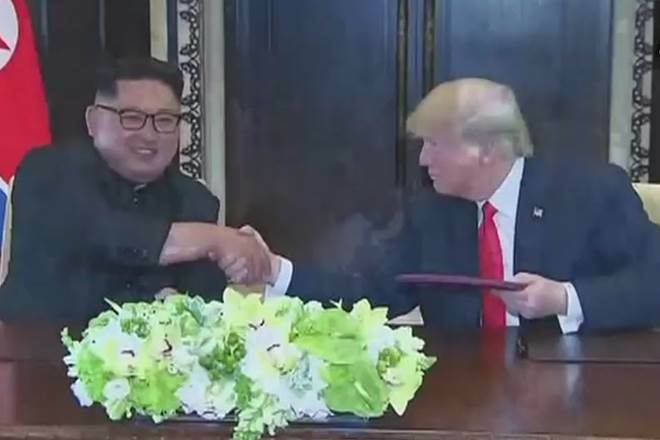 Donald Trump and Kim Jong-Un have signed a 'comprehensive document' after their historic summit meeting in Singapore. US President Donald Trump today joined North Korean leader Kim Jong-un for a working lunch which had a mix of Western and Asian dishes, such as Korean stuffed cucumber and beef short rib confit with some Haagen-Dazs ice cream to top things off. North Korean leader Kim Jong Un asserted in Singapore, "We overcame all kinds of skepticism and speculations about this summit & I believe that this is good for the peace." 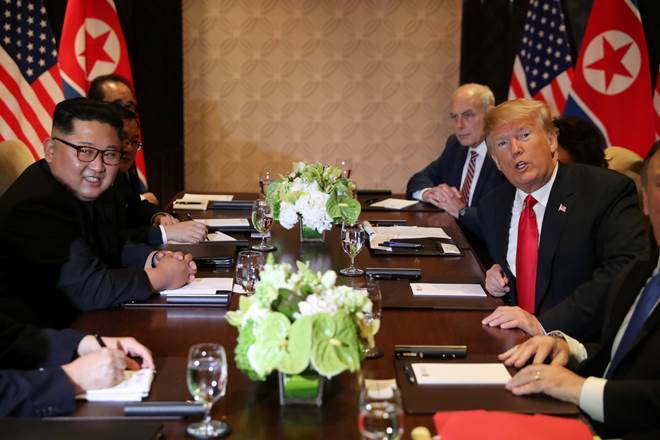 Donald Trump did most of the talking, and Kim appeared to listen attentively, turning to him three times during their walk toward their meeting room. But he also patted the U.S. president' arm, in an attempt to show control over the encounter. The U.S. President, who is more than twice Kim's age, then appeared to lead the way to the library where they held a one-on-one meeting, placing his hand on the North Korean leader's counterpart's back. 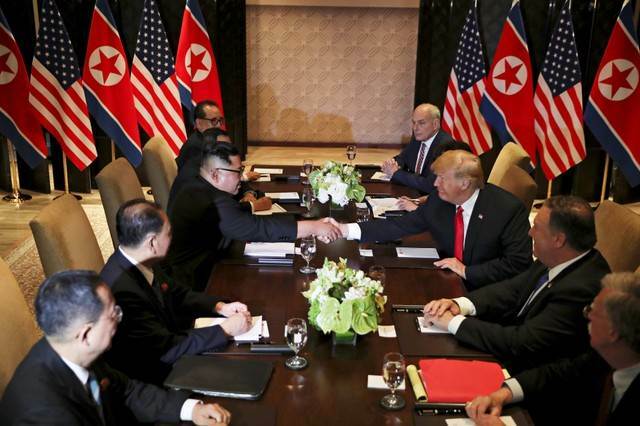 US President Donald Trump and North Korean leader Kim Jong Un hold an extended meeting and both leaders were joined by key aides, after 48-minute one-on-one talks with only their interpreters, according to AFP. 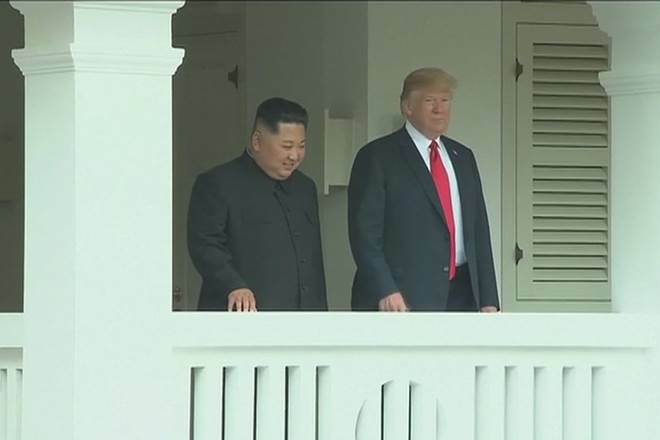 US President Donald Trump and North Korean leader Kim Jong Un walk together along balcony after one-on-one meeting. US President Donald Trump will depart for the United States at around 7 p.m. from the Paya Lebar Airbase. Kim Jong-Un is due to leave on Tuesday afternoon, accoridng to a Reuters report. Meanwhile, in US, six top American lawmakers from the opposition Democratic party have demanded that any potential deal with North Korea be subject to Congressional oversight. "Regardless of what happens in the hours ahead, the administration must consult with Congress on North Korea. Any potential deal must be subject to Congressional oversight," the Democratic leadership in the US House of Representative said in a joint statement. Kim Jong Un's convoy arrives on island where the North Korean leader will meet Donald Trump in summit. 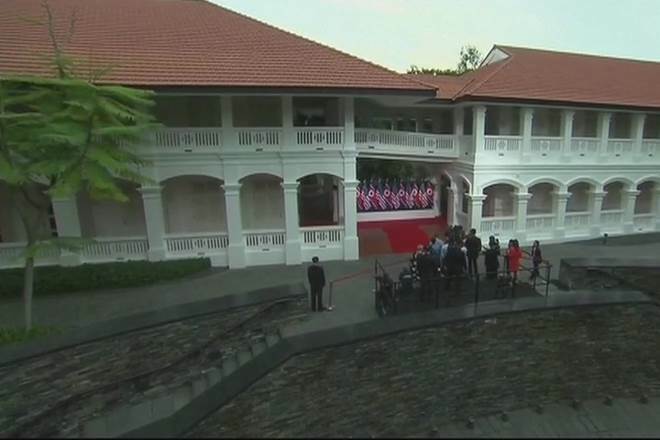 The convoy of Kim Jong Un has left for Singapore resort on Sentosa Island where the North Korean leader is scheduled to meet US President Donald Trump. The United States President has arrived at the summit site, as reported by AP. In the lead up to the summit, North Korea rejected any unilateral nuclear disarmament, and KCNA's reference to denuclearisation of the peninsula has historically meant it wants the United States to remove its 'nuclear umbrella' protecting South Korea and Japan, according to Reuters. US President Donald Trump arrived in Singapore on Sunday after a blow-up over trade with other members of the Group of Seven major industrialised nations that cast a cloud over his efforts to score a major foreign policy win in the nuclear talks. North Korean leader Kim Jong Un ahead of the historic talks with United States President Donald Trump said that he was impressed by Singapore's economic development and hoped he could learn from the country during a night tour of some of the city state's landmarks. While talking about Singapore, Kim said that it was 'clean and beautiful'. This statement was made by the leader while he was looking at the view on Monday from the observation deck of the Marina Bay Sands hotel, adding that he had learned much about the Southeast Asian nation's economic potential and how it had developed, according to Reuters. While talking about the meet, the White House said that the discussions of United States with North Korea had moved "more quickly than expected" and Trump would leave Singapore on Tuesday night, after the summit. Kim Jong Un, the world's most reclusive leaders made an evening tour of sites on Singapore's waterfront ahead of the big meeting. According to a Reuters report, while Donald Trump was optimistic about prospects for the summit between the old foes, a note of caution was injected by US Secretary of State Mike Pompeo. Donald Trump and Kim Jong Un are staying in separate hotels that are less than a kilometre apart in the famous Orchard Road area of Singapore. The are where the hotels are situated are dotted with high-rise luxury apartment blocks, offices and glittering shopping malls.